The hills are alive, with the sound of F1 cars once more! After the disappointing (yet unsurprising) exit of the England football team from Euro 2016, F1 provides a welcome sporting relief. 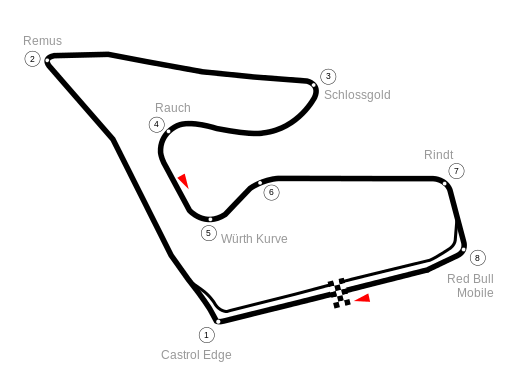 Austria has few corners, and the power nature of the track is likely to suit the Mercedes and their customer teams (something that qualifying showed, with Hamilton and Rosberg comfortably P1 and P2). However, intriguing variables have already kicked in, to ensure the race will be strategically fascinating. Both Nico Rosberg and Sebastian Vettel will suffer five-place grid penalties for unauthorised gearbox changes. This means Rosberg will start in seventh and Vettel in ninth, whilst Jensen Button will start third (yes, you read that correctly) and Nico Hulkenberg will start second. For McLaren, Button’s qualifying performance (aided by the variable weather conditions of Q3) was a welcome joy, especially after an error in tyres led to Alonso starting down in 14th. Hulkenberg’s placement was also due to drying track conditions, and the young German may prove to be an interesting wildcard in the race (Force India do after all, boast the same Mercedes engines as the works team). Since the A1 Ring returned to the calendar in 2014, Rosberg has won on both occasions. It’s a track he appears to like, whereas Hamilton has never seemed comfortable here. With Rosberg starting seventh, Hamilton has a golden opportunity to win here, and take a bite out of Rosberg’s lead. A shout has to go out to Pascal Wehrlein of Manor. He will start 12th, and qualified there on merit. It all bodes for a good race tomorrow!